Last month I recommended five modern science fiction books that I really enjoyed to my readers. Today I decided to write a follow-up post so that I can recommend even more great reads to you! Who knows? Maybe this will become a series on this blog. We will see what happens in the future. 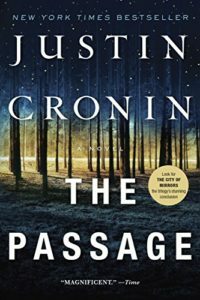 The Passage by Justin Cronin. A virus turns humans into vampires so quickly that our species is now on the brink of extinction. An FBI agent suddenly finds himself in charge of keeping an abandoned child safe in a world where no child is safe anymore. Humanity must adjust to this new world, so the rest of the plot is about how that happens over a long period of time and what happens when the precautions people take to protect themselves begin to fail. This is one of the most suspenseful and action-packed books I’ve read in a long time. Dividing it up into sections that told different pieces of the same story was a good idea. In some ways, it was sort of like three novellas set in the same universe one because each section was focused on such a specific part of the storyline. One of the other things I appreciated about it was that the vampires weren’t misunderstood, secretly romantic, or anyone’s boyfriend. They were violent, dangerous, ugly, and menacing. This black-and-white approach to the genre was refreshing. I really like it when monsters act like monsters. It’s a dystopia set in the near future. 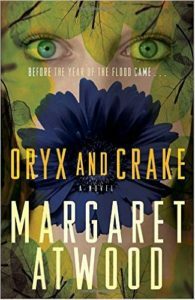 Jimmy, a man who thinks he’s the last living human on earth, is grieving the loss of his friends Oryx and Crake. His only companions are the Children of Crake, a small group of genetically-modified, human-like creatures who are about as intelligent as the average 7-year-old child. They think of him as a messenger from their creator and obey his every command. The plot thickens when Jimmy runs into his old friends and realizes that he isn’t alone after all. This is the first book in her MaddAddam trilogy. If you like it, the next two books in the series are just as excellent. The first thing that drew me into the plot were all of the flashbacks to life right before society collapsed. Your social class determines everything from what kind of school you’re allowed to attend to how much food you have to whether or not you survive in this society. It is a very rigid system that’s basically impossible to escape. The Children of Crake weren’t the only genetically modified creatures in this universe. In fact, they weren’t even the most interesting ones! I also enjoyed the storytelling. This is something I’d especially recommend to anyone who has read a lot of science fiction or who is already a fan of Margaret Atwood’s writing in general. She plays around with this genre in some pretty spectacular ways. 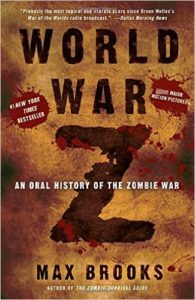 This is a collection of interviews done with people of all ages and backgrounds who survived the zombie apocalypse many years after humanity more or less won the war. Patient Zero’s experiences are included early on. Most zombie fiction doesn’t bother showing where the virus comes from or how it started to spread, so I was fascinated by this section. Another interview is with a feral child who somehow escaped being attacked and then survived alone in the woods for years before finally being rescued. Despite being much older now, this witness will always remain a small child as far as their mental understanding of the world goes. There is also a dog who was trained to fight the zombies as part of a military strike against them. That interview was obviously done with one of the humans who worked with the dog, of course, but it was fascinating to see how such a partnership was created and why it functioned so well. Regardless of whether you hated or loved the movie that shares the same name, this book is nothing like that film. The only thing they share in common is their title. I loved the interviews because they covered the civilian, military, and medical sides to the story. Some characters saw and fought multiple zombies. Others had more sheltered experiences because of the nature of the work they did or where they happened to be when the outbreak began. This reminded me of the oral histories I’ve read about real historical events. One person’s perspective can’t tell you the whole story, but you’ll learn a lot about what happened and what was possibly a myth or a misunderstanding if you interview many people and compare their memories. The title gives away much of the plot. 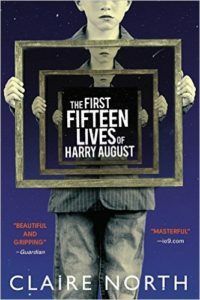 Harry August is a man who keeps living the same lifetime over and over again. No matter what he does or where he goes, every death that finds him only brings him back to the day of his birth. This isn’t to say that every single lifetime of his is exactly the same, though. He makes different choices every time that lead to happier (or sadder!) outcomes later on in life. I’m also intrigued by the idea of reliving your life in order to correct mistakes that you made in it. Would things be better or worse if you hypothetically took back those cruel words you spat at someone, or never travelled to the place where that awful thing happened, or ordered a salad instead of the shrimp special on your twenty-third birthday that gave you life-threatening food poisoning the last time around? 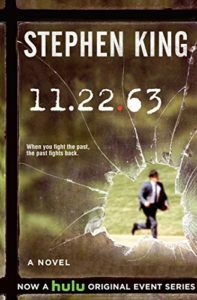 A high school English teacher named Jake who travels back through time to attempt to stop the assassination of President Kennedy. Like The First Fifteen Lives of Harry August, trying the change the past is much harder than it looks. Every time Jake changes one thing, the universe does its best to thwart him and restore time to the way it originally was. Why should you check it out? This isn’t your typical Stephen King tale. There are no monsters, demons, or gory plot twists. As much as I occasionally enjoy his pulpier work, this is a wonderfully mature and complex story that I’d recommend to people regardless of whether or not they’re already a fan of this author’s writing style. This is one of those rare cases where I’d recommended watching the TV show by the same name just as much as I’d recommended reading it. Is it cheating to admit that I’m not entirely sure I finished the book when I tried it a few years ago? It’s been so long ago that I can’t remember for sure, but I love the TV show so much that I’m now planning to give the original story another try. Sometimes it takes me a few tries to read all the way through a full-length novel, and there’s nothing wrong with that. This is the kind of story that excels on the small screen because of how much it depends on small details. In this case, visualizing those little details was much easier for me to do by watching it unfold one episode at a time. You may want to try both and see which one appeals to you most.